The Terrex Boost is a 10.2 oz, 6mm drop trail runner for Spring 2015 which will retail for $160. Below the Boost material is a super well lugged Continental rubber outsole. Continental is on my other Boost shoes (adios, Boston, and Energy) and the wear is minimal after many miles The outsole is fairly firm and looks very durable with I would expect great grip on rocks and mud. The shoe is decently flexible with a sock like upper. The rear red section is a TPU film to add some stability. The adios and Energy Boosts have a similar support while the Boston does not. In my view, as Boost is fairly soft and bouncy, a bit of guiding side wall support is essential and well placed on Terrex Boost. The shoe has speed laces. While I have not tried adidas version I tend to prefer real laces. 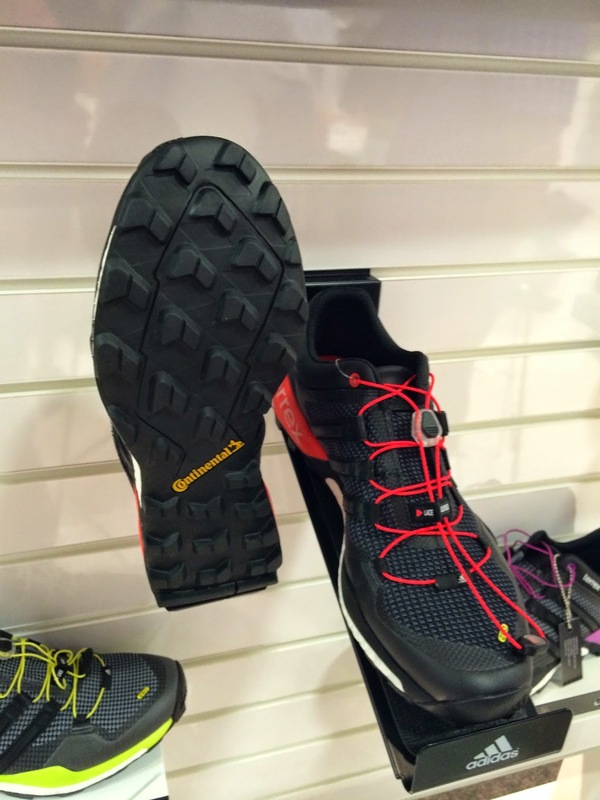 I can't wait to try the Terrex Boost as it would seem to me the combination of firm outsole and supported bouncy Boost will make a very responsive yet also stable trail runner.